HDMI over single cat5 extenders comes to the fore, when we compare with other hdmi over cat5 extenders that require two network cables for installation. This feature does not create much difference at short distances, but for long distance projects this feature allows quick setup and affordability. As we mention before, the bandwith that has been provided by network cable is very important for this technology. The video+audio signals should be transfered as continues and uninterrupted. These products getting market regulary, so you can check the latest hdmi over single cat5 extenders from this place. 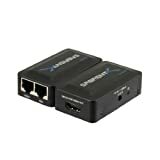 Why does Hdmi Over Single Cat5 Extender use one network cable? When we examine the HDMI data we see there are different signals such as HDCP, E-EDID and DDC with video+audio on a single HDMI cable. Video+audio are known by everyone, but other terms may sound foreign to you. 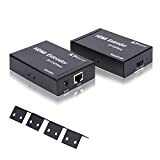 However, the difference of using one or two network cables to make the choice will not make much sense without knowing the other product details. E-EDID and DDC (Display Data Channel), are used to make screen resolution, brights and contrast signals to be auto recognised by target devices. In the past, this kind of intervention should have the right settings could be made by hand or manual switchs. However, with improving the technology these settings can be made in an automated manner and prevented the loss of users time with unnecessary settings. HDCP, is a protocol that has been created to prevent movies being copied on HDMI cable. In this context, some manufacturers preferred to produce devices that can send this information via a single network cable, others use two network cables seperated for each video+audio and DCC+E-Edid combination. Only using one cable, this is an easy way to install HDMI over a long distance. Single cable solutions require significantly more engineering because they have to multiplex the control signals onto the same cable that carries video and sound. Even so, they seem to perform better than double cable devices in many cases. Maybe the reason is that real engineering is required to make them work at all. There is an extra processor in the device to parse the incoming mixed signal correctly, so it is usually a little more expensive depending on the model of two-wire network cables. The use of any of these devices is safe in distances specified by the manufacturer. As an example, a lot of people say the following model gives successful results. Hdmi Over 1 Single Cat5e/Cat6 (Up to 150.. These models will send the required HDMI signal over two network cables. Each allocated cable used for video+audio and DDC+E-EDID transactions. In addition, as a more affordable price compared to the hdmi over single cat5 and appears to support longer distances. However, the second cable requirement is unavoidable. Sabrent HDMI Extension cable over Cat5e/..
Our recommendation is when choosing a product, choose the right model that supports the appropriate options for your project, rather than just looking at cable quantity. Whether hdmi over single cat5 or hdmi over cat5 extender can be your better solution depends on what your specific implementation is required. « Hdmi 1.4 Over Cat5/Cat5e/Cat6 – Which one is possible?